There have been many tributes to Apple co-founder and former CEO Steve Jobs since his untimely succumbing to pancreatic cancer back in October of last year. Having helped revolutionize a range of products – from portable media to smartphones and tablets – it was only right that the tech world bode a fond farewell to one of the greatest innovators of this generation. Hungarian firm Graphisoft – which was sponsored by Jobs at start-up stage – unveiled a bronze statue of the Apple guru in December at its base in Budapest, which depicted a bespectacled Jobs in his typical get-up of a polo-neck, jeans and trainers. Chinese outfit InIcons did prepare to release a realistic, foot-high figurine of Jobs – complete with a spare pair of those iconic specs, as well as two sets of backup hands. The move was scuppered by Apple, however, preventing the $100 model from ever retailing, for obvious reasons known to mankind. 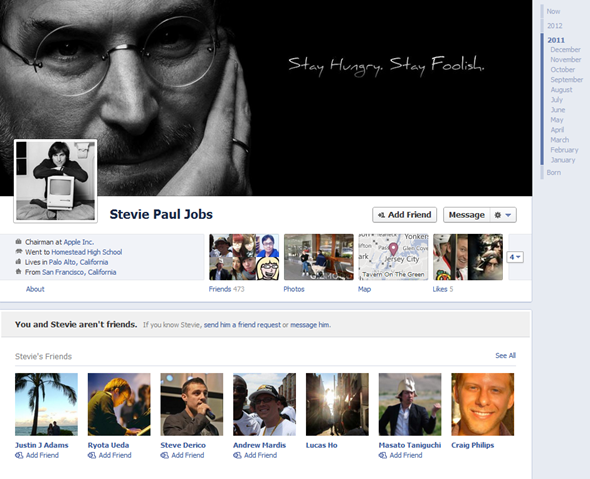 Today, one Singaporean web and mobile developer used the fairly new Facebook Timeline feature to create a great exhibition of Steve Jobs’ life. 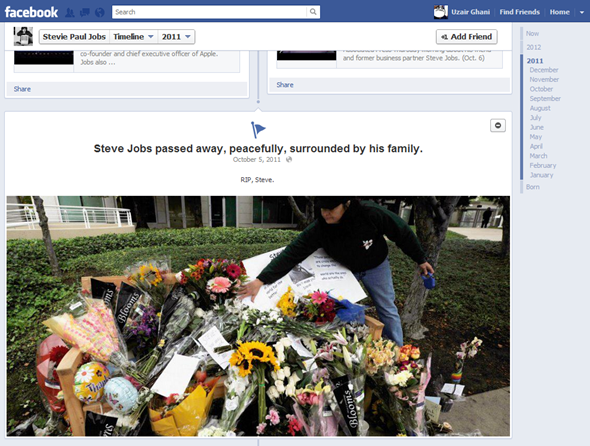 Unfortunately, despite Facebook founder Mark Zuckerberg citing Jobs as an inspiration, the world’s most populated social network felt the need to remove the associated account – meaning only the early birds caught the proverbial worm, but luckily at the time of writing, the link started to work again. Seems like Facebook has a soft spot for such feats. From adoption, dropping out of college, to getting sacked from his own company and developing one of the deadliest of the dreaded cancers, Jobs rarely let external factors distract him from what he set out to achieve. As the Walter Isaacson book notes on a number of times, the great man did lose his cool, and harbored a lot of angst and animosity – particularly towards rivals. Having said that, they do say competition brings out the best in people, though, and that was certainly never truer than in the case of Jobs. You can check out the Timeline on Facebook yourself by heading over to this link.